Over the years, to alter landscapes and hold back soil, there have been many different types of materials used to make retaining walls. Some popular materials include railroad ties or treated timbers, as well as wall stones, natural stones, bricks and concrete blocks. Wood is generally the inexpensive and simple choice for a retaining wall, but its short lifespan makes it a relatively poor choice. 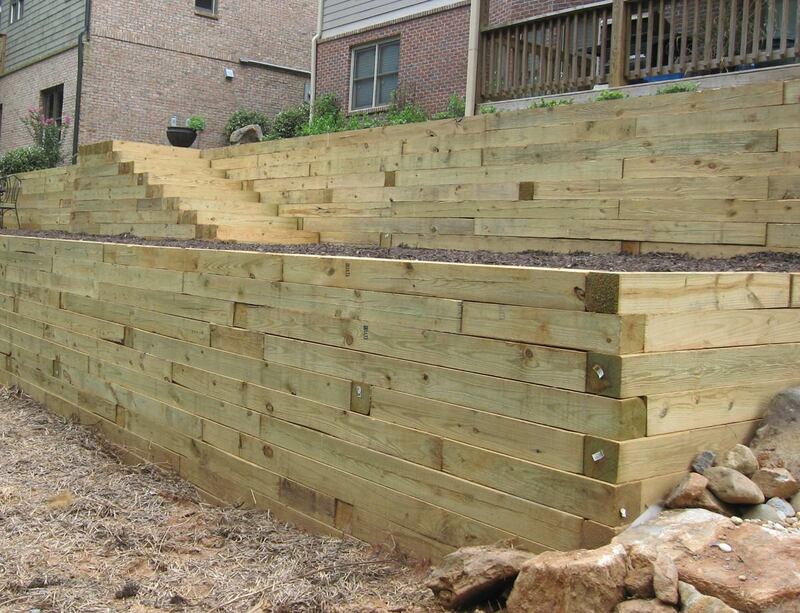 The integrity of your usable space and your retaining wall decomposes as the wood does. Rocks, boulders or stones can create aesthetically pleasing retaining walls, but installing these materials can be both labor intensive and expensive. Additionally, keeping up with the maintenance of stone walls be become quite difficult, because rodents or weeds may call them home over time, as well as erosion. Another option is cast-in place or mortared retaining walls. To add texture and style, these walls can be installed of veneers, bricks, flagstones, etc. With rigid structures which will not move or flex with climate changes, earthquakes or other natural forces, these walls can be very expensive to build. Much like the Allan Block products, SRW’s (Segmental Retaining Walls) consist of concrete masonry blocks that interlock for ease of use. 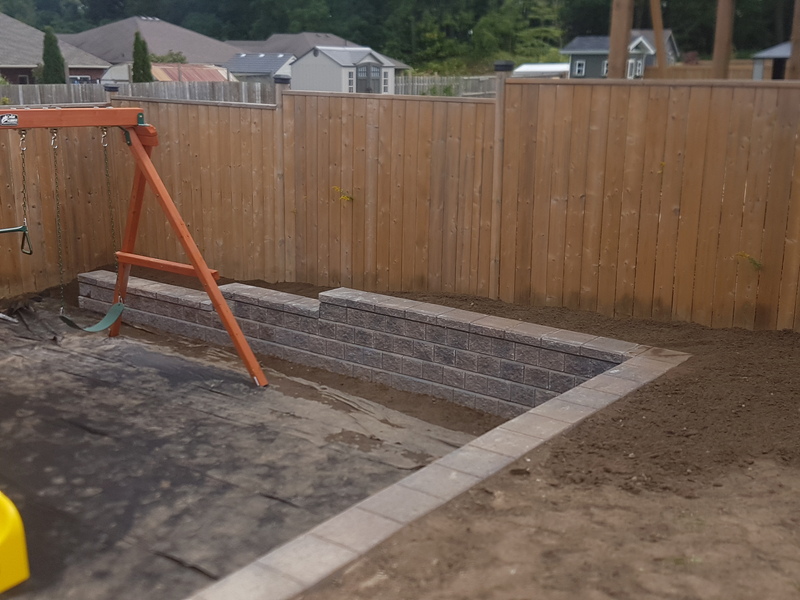 Using our installation information, you can simply stack the mortarless blocks together to create a maintenance-free retaining wall to add usable land, fix a grading or slope issue and can also solve many other problems on the site. These walls use the similar construction techniques found in the Great Wall of China and the Pyramids of Egypt and can stand the test of time. The variety of these walls comes in the color, size, shapes, as well as the facing textures. Some of the common textures offer a hard or soft-split look, a tumbled look, or the most recent texture choice, a stamped face. If you’re more environmentally friendly, concrete blocks made of recycled materials are also available. When choosing to build a wall with an SRW, you can be certain it will be built to last. Is a retaining wall right for you? Simplicity. 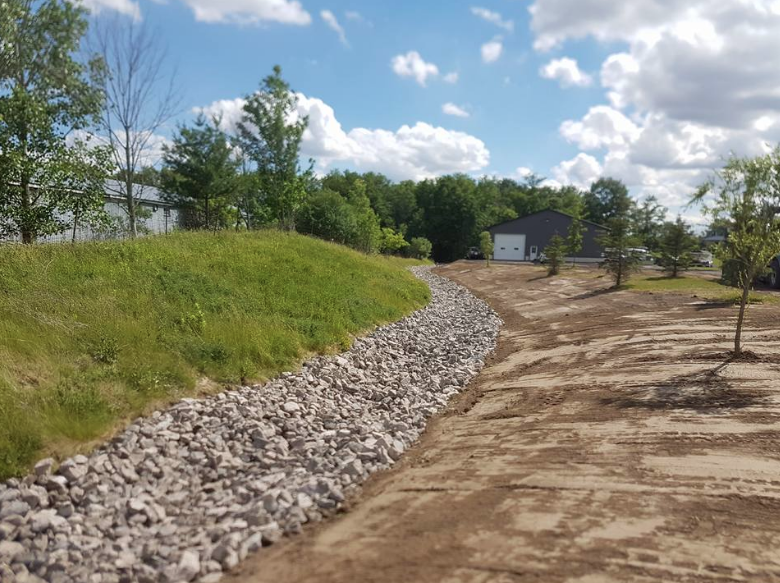 Rather than taking out an entire hill or hollowing out a pit below the soil lines, you can construct a retaining wall, the easiest solution to an age-old issue, and accomplish the same thing with more ease and less environmental impact. Being a sought-after solution for many years when it comes to hillside farming and dirt basements, retaining walls are the natural no-frills to an irritating problem. Cost. 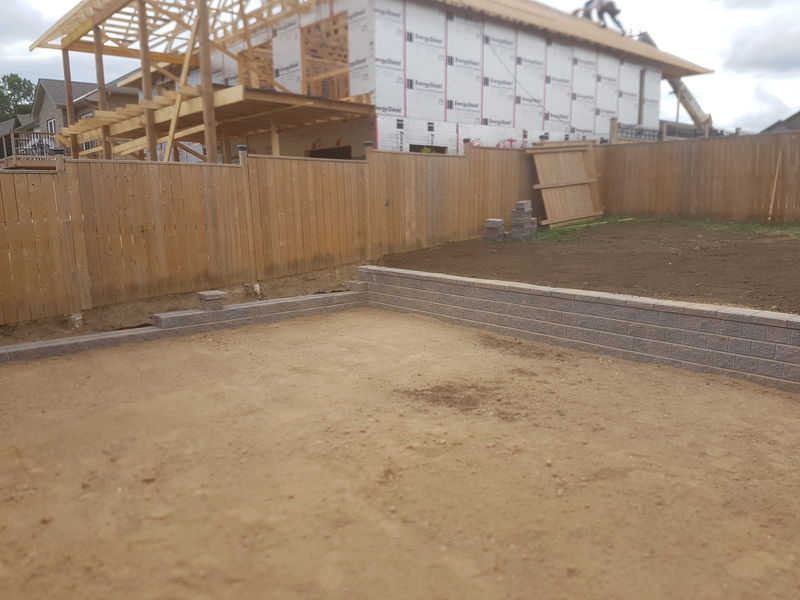 When we consider the simplicity of retaining walls as an option for landscaping your property, our costs are, by comparison, greatly inexpensive. Aesthetic Appeal. Being simple classic features of landscape design and depending on your preferences for materials and other surface design features, retaining walls can appear bucolic, modern, or simply unobtrusive and naturalistic. 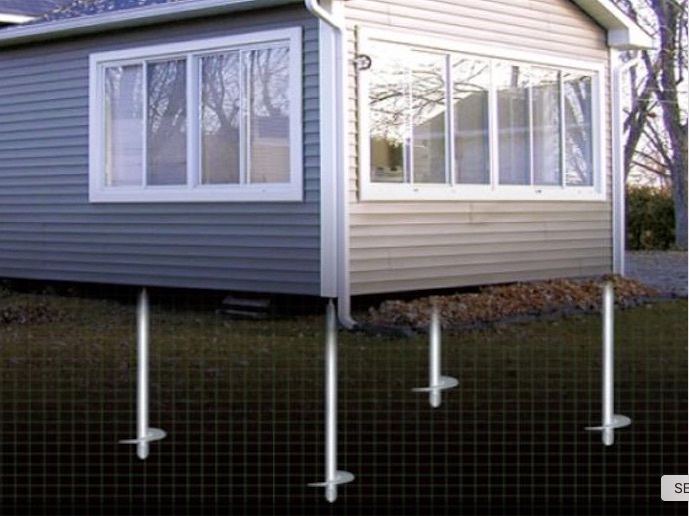 Here at Full Bucket Contracting, we have years of experience and over time perfected a unique level of technical expertise. If the factors listed above aren’t enough to convince you, consider the benefits of coming to us for your retaining walls. 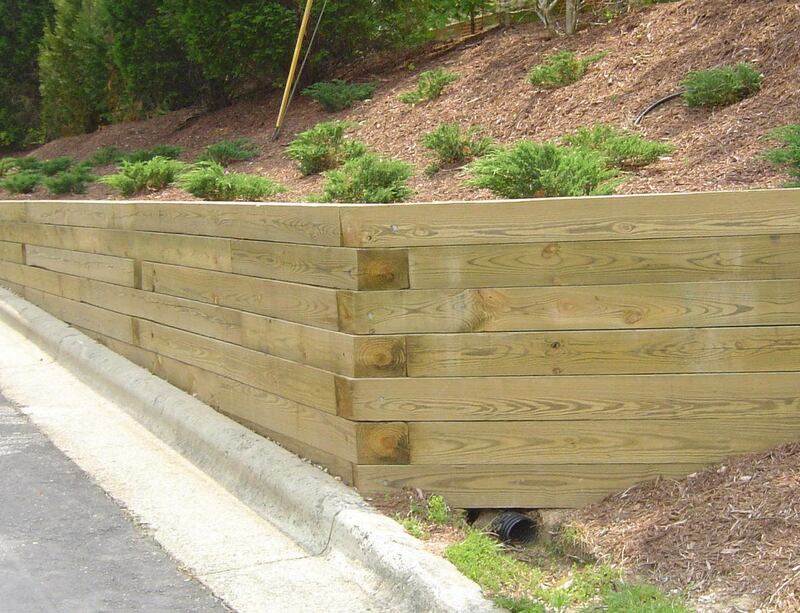 In addition to completing a safe and speedy installation, we can build many variations of retaining walls. Retaining walls are built to hold or retain the ground behind it. We construct many types of retaining walls. A few of the more popular types for this area include concrete blocks, poured concrete, treated timbers and rocks or boulders. While all these styles retain soil, the complexity and lifespan you are looking for will help you determine the type of wall that best suits your needs.